HOLLYWOOD—One-time Bond girl Jane Seymour has a list of accomplishments to her credit: actress, producer, children’s book author, self-help guru, jewelry and home décor designer, mother and (believe it or not) grandmother. She reveals during a recent exclusive interview that she has yet another moniker—Moadie. What’s a Moadie, you ask? “It’s a mother roadie,” the actress explains with laugh. One of her sons is in a rock band, and because he’s underage (17), mama Seymour tags along to his gigs. She has four biological children and two stepchildren from her various marriages. She recently split with husband No. 4, actor/producer James Keach. Though she doesn’t directly address her divorce, Seymour remains a die-hard romantic. She points to a diamond-encrusted pendant (which she designed herself), and speaks about her philosophies of keeping an open heart and living life as though on the wave. Born and raised in Middlesex by a physician father and nurse mother, Seymour got the acting bug after she gave up on a ballet career following an injury in her teens. 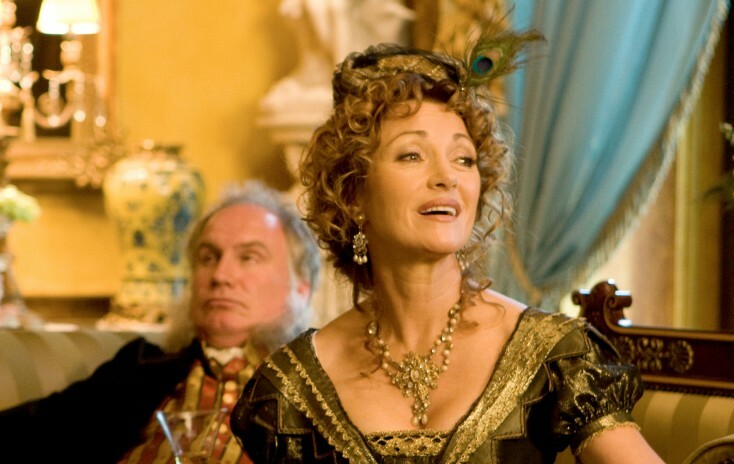 She changed her name from Joyce Frankenberg to the more stage-friendly Jane Seymour (after King Henry VIII’s favorite wife) as a teen. Petite and drop-dead gorgeous then as she is now, Seymour has gone from ingénue roles (“Oh! What a Lovely War”) to romantic dramas (“Somewhere in Time”) to dangerous beauties (“East of Eden”) to period dramas. She starred for eight seasons as the frontierswoman physician in the American drama “Doctor Quinn, Medicine Woman,” where she met Keach. Having reached a certain age, Seymour has survived the finicky world of show business by always adapting. She was a standout as a cougar in the 2005 comedy “Wedding Crashers.” She sends up her classic British image and proudly allows her wrinkles to shine through in the female-oriented comedy “Austenland.” The comedy is directed by Jerusha Hess (writer of “Napoleon Dynamite”) and produced by “Twilight” author Stephenie Meyer. She plays humorously haughty proprietress Mrs. Wattlesbrook, who manages an English estate where fans of Jane Austen can immerse themselves for a week in all things Austen—including a “Pride & Prejudice” type romance—for a price. “Felicity’s” Keri Russell plays an American Austenphile who takes the excursion to find the Mr. Darcy of her dreams, and gets more than she bargained for. Dressed in a teal color Nicole Miller cocktail dress for an interview that shows off her still attractive figure (thanks to a daily Pilates workout), Seymour is chatty and open. Her long, reddish-blond hair falls loosely around her shoulders. Q: In the past few years, starting with “Wedding Crashers,” we’ve started to see this zany side of you. What prompted you to start taking these offbeat roles? Seymour: I’ve always been kind of goofy to anyone that knows me. I used to do a lot of comedy in the theater. It’s just that for a while there, I was given all these wonderful romantic roles, the ingénues, the romances. Then they discovered I could play evil after “East of Eden.” So I got to be the multiple murderesses on many occasions. I did “Dark Mirror” and all that kind of stuff. Then I played victims and they realized I could cry so. I did “War and Remembrance,” where I got to be a victim and cried a lot. Then with “Dr. Quinn,” I got to do all of the above. You hit a certain age and then in Hollywood, it’s done. You’re done. I think the fact that I don’t take myself that seriously at all and that I can play comedy surprises people. Q: Some of your contemporaries haven’t been able to make that progression. How did you do it? Seymour: I remember Sir Peter Hall, when I did “Amadeus” on Broadway, hired me on the spot when I did my audition there, which was illegal. He wasn’t supposed to do that. I took me aside and said, “Don’t tell anyone but will you please promise me you’ll be there for rehearsals in August,” and I said, “I’ll do it.” He referred to me as a character actress in spite of myself, which I consider to be the highest compliment. Q: Do you still have your 1,000-year-old home in Bath? Seymour: It really was heavenly and I was there very recently. I just made another film there. You can almost guarantee that I will do a movie when it happens to take place in that part of the world because I’ll take any excuse to be back there. I just did something for Germany called “The Unknown Heart.” Rosamunde Pilcher—a romance thing, playing, again, a character role. I was staying in Bath, so I was in absolute heaven. The person who bought my old home lets me visit from time to time. So I went back there and hung out with the neighbors and had a fabulous dinner on the grounds. Seymour: Actually, not that much. They bought everything, exactly how I had it—all the furnishings, everything, the art, the books, everything. Q: You’re a designer and an entrepreneur and of course, you have your jewelry line. Seymour: Yes. The new is called “The Wave.” (She holds a delicate silver and diamond-encrusted pendant around her neck.) This one has a great story, really. Actually, it’s not new. I’ve spoken about it in books that were published 10-12 years ago. But my whole concept about life is however you were born, whatever your circumstances, it’s like you’re in a body of water. You’re kind of moving without realizing it in a direction. And you go to school, you get raised, and then something wonderful happens—you fall in love, you have a crush, you make the team, you win the prize, whatever it is, and you get that first high and it’s like “Ahhh.” Then, of course, it comes down. For a lot of people, they quit. They think, “Why am I not staying in that (high) place.” Well, a wave like life is full of ups and downs but the way I see it, the wave lets go of water it doesn’t need, survives the crash, keeps moving and takes the experience of all the above, meets water it never met before, collaborates and creates a new wave. Q: When did you come up with this philosophy? Seymour: Quite a long time ago. I wrote about it in a book called “Remarkable Changes” and I’ve been on speaking tours but I decided to manifest it in my artwork and I thought it would make a great piece of jewelry. The whole concept is unless your heart is open you can’t accept those changes in your life. And at some point, everyone deals with changes in their life. Q: As you get older, you have gained so much knowledge and experience about life, that you wouldn’t want to be young again. Seymour: I feel exactly the same way. It’s really funny having grandchildren. My daughter (Katherine) hands me my grandchild and says, “Mom, you’ve got to do this.” And I say, “Excuse me, I’ve had six of you. I’ve had two of you at a time not that long ago. I think I know what to do with a baby.” She seems surprised and says, “You know how to do these things?” and I go, “Yes! I haven’t forgotten.” It’s been a very exciting time for me. You get to a certain age where you’re not trying to prove anything to anyone. I’m not trying to be 30. I’m not trying to look like a 30 year old or anything like that. I’m just being me and I’m comfortable in that. And if I play an older woman with gray hair and wrinkles, or I get to play crazy Mrs. Wattlesbrook (in “Austenland”) or whatever, I’m excited by that. The more variety the better. And I feel that right now is when I’m going to do my best work so it’s just a question of finding good material. Q: So many women are terrified of getting older. They get facelifts and tucks and different surgeries. Seymour: I haven’t done any of that stuff. Q: You look fantastic so you don’t need it. Q: Sharon Stone is almost unrecognizable without makeup in “Lovelace” so obviously she subscribes to your view about aging gracefully. Seymour: The fun part for me is that a lot of the films that I’ve done recently are people who’ve hired me again and again. Like, it’s been the same producer. They’ll give me a role that’s completely different from the last one. Nothing is more thrilling to me than to be asked to come back by somebody you’ve already worked with because that’s the ultimate compliment. I do this little TV series from time to time called “Franklin & Bash” (on TNT). Bill Chais keeps writing this edgy, completely off-the-wall stuff for me. It’s fun; I enjoy it. Q: You’ve lived in Malibu for years but do you go home often to England? Q: What, besides acting, are you up to? Seymour: I’m still designing furniture and silk flowers. I’m still working with the Open Heart Foundation and do art shows all over the country. I still have a couple of high schoolers. One of my sons is in rock ‘n’ roll right now. Seymour: It’s called Strange Native. He’s the lead singer. Three of them are 17 year old and one of them is 21. They’re incredible. I think I’m going to be phased out very soon. As soon as they turn 18, there will be no Moadie action. The other (twin) is an amazing baseball player. My son, Sean, is a fine art photographer. He’s showing in galleries all over the country. He’s got an exhibit coming up in October at the Sunset Plaza (in West Hollywood). He also shoots music videos. He just shot one for Shwayze and one for Strange Native as well. Q: They’re following in your artistic footsteps. Seymour: The truth is I’ve tried to educate them to do something else but the problem is monkey see, monkey do. The monkeys saw that I was having too much fun doing artwork, producing, acting and the rest of it. They’re not doing what I do but it’s very creative.